I have eczema and sensitive skin. Commercial masks maybe convenient to use but they also rather pricey. Sometimes I develop skin irritation after using them and regular facial treatment at a salon is financially out of the question for me. So I decided to make my own masks that will help ease my eczema woes with what I can find in the kitchen. 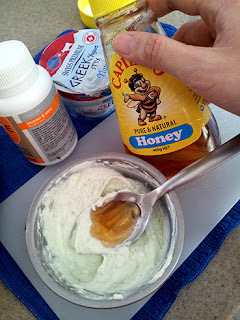 This is a very versatile recipe and most of ingredients used are edible. It may be rather messy to wash it off and inconvenient when you are in a hurry, but it costs less than $3 to make and will last you around a week if you use it everyday! Moreover it works just as well as a store bought mask. I use Japanese cucumber. They come in a bag of two or threes. It makes a crunchy refreshing fuss free lunch with a sprinkle of salt and dipped into the yoghurt. 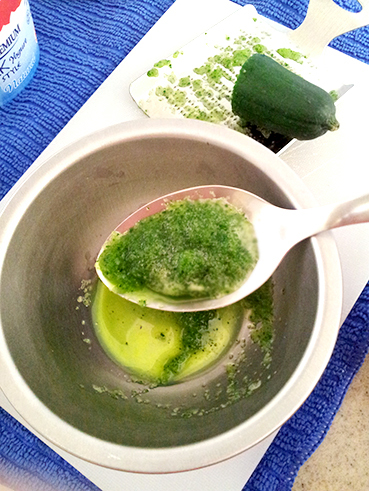 Cucumbers are cooling, soothing and moisturizing because they are rich in vitamin A, K and B5. Cucumbers also contains silica, a precursor to collagen, which helps fight wrinkles. A change of diet helps alleviate acne problems. Less sugar, less carb, more fibre, being happy and drinking plenty of water helps a lot. I wouldn't use the flavored ones because of the flavorings and addictive. 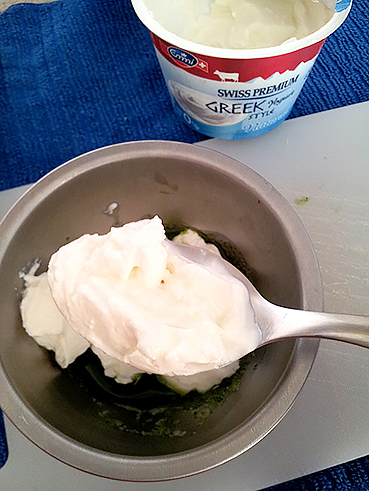 ^^) The rest of the yoghurt is good to eat it on it's own or as salad dip... or even to make a frittata. Yoghurt is hydrating and has whitening effect. It softens the skin and is rich in vitamin D. It is also good for soothing acne and eczematous symptoms. The consistency is up to individual's liking. I use rice flour because it is what I have. Sometimes I use soy powder which makes the mask thicker and gel-like. You can use cosmetic powder clay or even milk powder. *Always check the ingredients of a product. Olive oil/ sunflower oil/ grapeseed oil/ coconut oil/ jojoba oil.... basically what you have as long as they are clean... and not rancid. 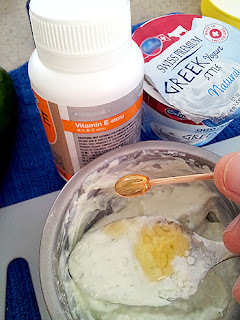 If you are taking supplements ( the gel capsule type ) spare a capsule for this recipe. Oil and vitamin E acts as an ointment and a form of preservative. Rosemary, Basil, Geranium, Rose otto, Frankincense etc. Adjust the amount according to the type of essential oil. Please take note and keep away from the type of oil that you are sensitive or allergic to. Citrus oil is photosensitive so it may burn your skin so please use them with caution. Please do not use aromatherapy oil as they are different from 100% essential oil. They are not suited to be used on skin. Animals are sensitive to essential oil and perfume, do keep them away from small children and pets. 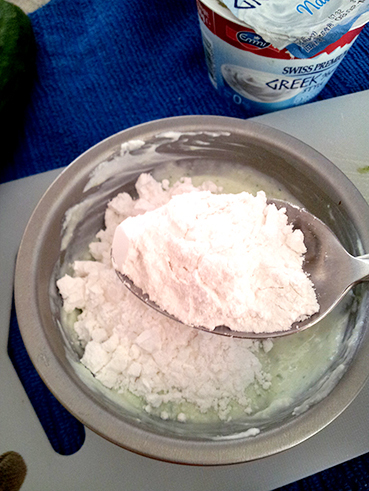 6) Mix all the ingredients till a whipped cream consistency, lump-free. Not too watery. You don't want to look like a zombie exposed to radiation with the green tinted goo dripping down your face and neck. Neither do you you want the mask to be thick and lumpy which will be difficult to spread on the face. Chill it in the fridge for 30 minutes before use... just because it feels good chilled. Spread it across the face, leave it on for 15 minutes and then rinse or wipe it off. 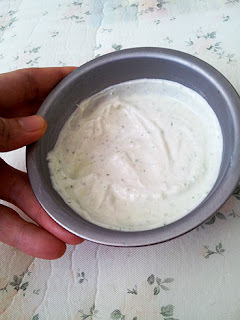 7) This recipe yields enough to last around week if you use it once daily. 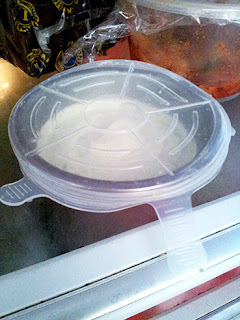 Please keep it covered or lidded in the fridge. 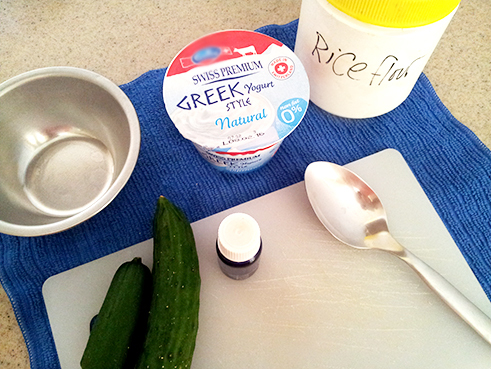 If yoghurt is unavailable, use more cucumber with honey or/and aloe vera gel. If you don't have a cucumber, you can replace it with avocado or aloe vera gel.